Hello there! I hope you had an amazing weekend. I don’t know about you, but I have seen a lot of FB and Insta posts with sick people over the last few weeks. A lot. It makes sense… these crazy drastic weather changes in so many areas seem to cause more sniffles than usual. Not that I want winter to linger on any longer, but can it PLEASE make up its mind already! Staying or going?? Whenever I get congestion or a runny nose, I like to use vapor shower cubes to help clear out my sinuses and to help me breathe a little easier. The ones that you can buy at the store are filled with so many ingredients that I have no idea what they are, so therefore I don’t really feel like inhaling those while I take my soothing shower to try to feel better. 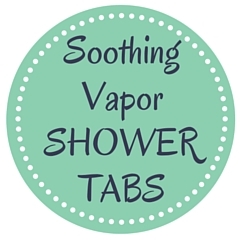 After using my Congestion Relief Pillow Spray, I decided I should take a go at making the other soothing relief I get, my own all natural vapor shower cubes! These are made from simple ingredients that you likely have on hand in your pantry, along with essential oils. I really like the combo of Eucalyptus, Lavender and Tea Tree essential oils, but if you don’t want to get all of them, I found Eucalyptus and Tea Tree oils to be the most clearing. If you’re an essential oil newbie, this is a great little variety pack with a great value. 1. Sift baking soda; slowly mix in water until mixture is the consistency of runny toothpaste. That’s the best comparison I could come up with ;). 3. 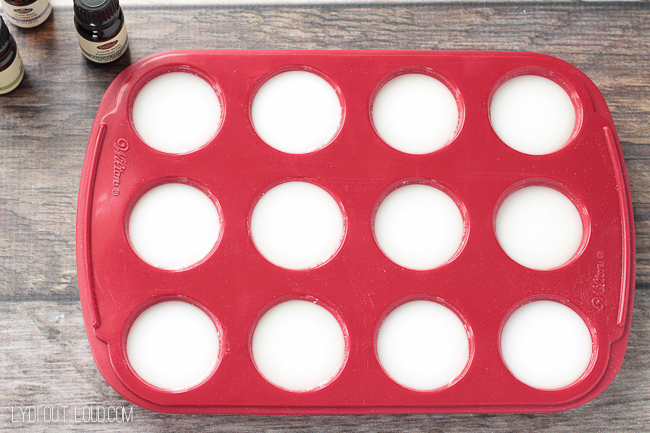 Spray muffin pan with nonstick cooking spray. 4. Pour baking soda mixture into muffin pan, continuing to stir as you spoon mixture into pan, it will thicken quickly. Add essential oils on top. Note: I use a mini muffin pan, but you can use an a regular muffin pan as well. I highly recommend you use a silicone pan, as the mixture tends to stick. 5. Bake at 350º for 20 minutes. 6. Allow to cool and then gently press cubes out of muffin pan. To use: Add a few more drops of essential oil just before using. Place on the floor of an already warmed shower in stream of water; close to drain. Gently breathe in and out of your nose to experience soothing relief. Relax and please feel better soon! These are great to have on hand for your next cold or allergy bout and also to deliver to sick friends or family; they will thank you in abundance! You can get the printable label here. Thanks for stopping by today… I hope you stay healthy and never need these (although they’re so relaxing that you can still enjoy them even if you don’t NEED them)! Hi there! So excited to make these. Do you need to use a carrier oil in these if i’m using pure eucalyptus oil? Hi Sarah! I would recommend it still because otherwise it would take a TON of eucalyptus oil! I haven’t made these yet, but plan to. I am reading the comments.i would think peppermint oil would work as well. It is really strong. I usually put a drop of it in the bottom of the tub when showering with water at the bottom. This helps when I am sick. I would think adding it to these would help a lot. I just made these and they’re kinda crumbly, a couple of them broke. Do you know if there’s something I can do differently the next time I make them? Thanks. Hi Rebecca! At what point did they crumble, getting them out of the mold? If so, what type of mold did you use? Hello, how do you store these? I have been looking at different recipes and one said to keep them in the fridge!? Hi Elizabeth! I just keep them in an airtight container in the medicine cabinet and that has worked great. I made these for the first time. I used 350 degrees for 20 minutes. They did not harden. Do you think it safe to assume they needed more oven time? I left them out overnight in the molds too. Any advise? Are the shower tabs safe for children age 3 up? Hi Debi, as long as the children don’t handle them directly it would be safe. You just wouldn’t want them to touch them and then rub their eyes. Hi Kay! I noticed that they lost their scent after about 8 months, you could always just add some more oils in that case. I wouldn’t use them after a year or so. Hi Ari! I haven’t tried using VapoRub but it might be good to try a small batch to make sure it works… I’m just not sure if it would harden up as much. Let me know how it goes, I’m curious too! I love all things with essential oils, these are amazing! Hello – I did try making these and even added more drops of essential oils(before going in oven and after they came out of the oven) . I placed them by the drain – but did not notice much of a scent – I followed your recipe exactly – any other ways of making these? Hi Ida, I’m sorry you couldn’t smell them! 🙁 I had another reader email me that they wanted a stronger scent so they added some Vick’s Vaporub (the cream) into the mixture and the cream-gel like texture apparently made it not drain as quickly so the scent lasted longer she said. Maybe you could try that and let me know how that goes for you? Thanks for letting me know! Another recipe I read said to add the 3 drops of 3 oils once out of the oven. I was wondering if some of the oils might lessen when in a hot oven, you know, kinda diffusing out ??? Your opinion ? The essential oils ingredients above, is that per cube once the baking soda mixture is poured? Hi Stephanie! The quantity is the total for the whole batch. If you’d like to add more just before use though, you could add another drop or 2 of one of the essential oils. Well then your directions are wrong, bc you say to add the oils to the top of the mixture after they’re in the muffin tins. which is it? Hello! So how many drops do you recommend of the eucalyptus oil? It’s blank here in the recipe. Thank you! Hey Michelle! Oh my goodness thank you so much! I didn’t realize it wasn’t there! Oops! I use 4 drops of eucalyptus oil. Thanks again, now I added it to the recipe! 🙂 Enjoy! Have you used these without the extra drops of essential oil right before use? I’d love to make some as gifts, but the recipients probably don’t have essential oils to add before use. Thanks! Hi Aimee, I haven’t tried them without the extra, but what I would suggest in this case is adding in a little more essential oil into the batch so that there will still be plenty of scent in case they can’t add the extra before use. Thanks for reaching out! This is such a great idea – Love your pictures too!! Thanks so much! And I will definitely do that! Never heard of these but it makes so much sense! Thanks for sharing. I wish I had these last week when I had a nasty cold! Thanks for the tip though I can use them next month when the weather changes again and I get my April congestion. What an awesome natural recipe. You made them look so professional. Thanks for the tip.